KALISPELL, Mont. 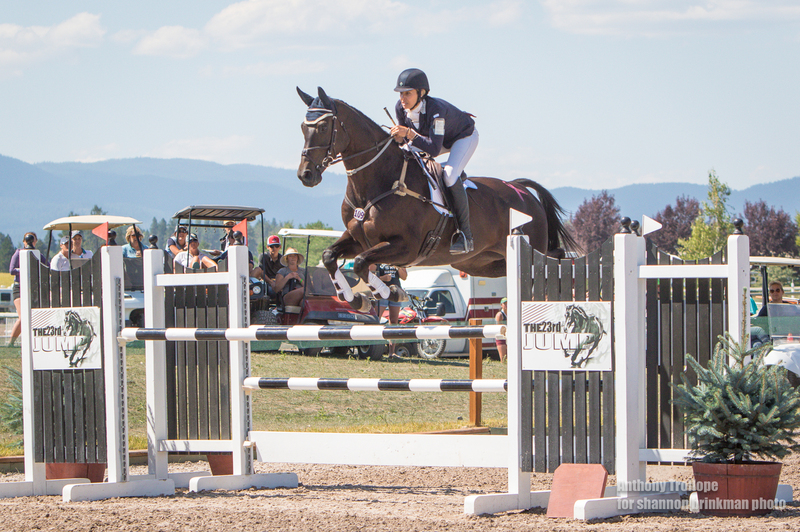 (July 22, 2018)—For the Broussard Family, The Event at Rebecca Farm is an opportunity to bring two of their favorite things together: the Kalispell community and the sport of eventing. “We’re more than just horses,” Event Organizer Sarah Broussard said as local families and competitors from near and far pass behind her on the Rebecca Farm show grounds. The Event at Rebecca Farm wrapped up on Sunday, closing out five days of food, family fun and spectacular athletes - both the human and equine variety. CCI3* Winner Frankie Thieriot Stutes of Occidental, CA, on horse Chatwin. competitors from across the U.S. vied for $30,000 in total prize money and generous prizes from multiple sponsors. Frankie Thieriot Stutes of Occidental, CA, rode Chatwin positively around the show jumping course, casting away some doubt from past performances. “I just can’t believe it,” Thieriot Stutes said, “I hold us to our standard, just the best we can be, and I’m so happy with him.” Thieriot Stutes had only one rail down, ending with a score 32.1, to hold the lead over Caroline Martin and Islandwood Captain Jack. Tamara Smith (Temecula, CA) maintained the lead in the CIC3* division with only one rail down as well. Her mount, Fleeceworks Royal, handled the pressure and high stakes of The Event with ease. “[The Event at Rebecca Farm] is our favorite event,” she said. “Our whole family comes with us - we set up a compound (and camp) here. We love it.” Smith finished with a 39.4, topping Emilee Libby and Jakobi, who jumped double clear, with a three-day total of 43.3. Rounding out the international levels, overnight leader Heather Morris (Wildemar, CA) scored a 32.1 in the CCI2* division on Charlie Tango for the win. CICOY2* Winning Team from Area II. From left to right, Ryan Keefe (Sandy Spring, MA), Alexa Lapp (Lancaster County, PA) on Cambalda, Olivia Dutton (West Grove, PA) on Mr. Medicott, Tayler Stewart (Damascus, MA) on Ideal Contini. Area II took the CICOY2* win with Tayler Stewart (Damascus, MA) on Ideal Contini, Alexa Lapp (Lancaster County, PA) on Cambalda, Ryan Keefe (Sandy Spring, MA) on Flintstar and Olivia Dutton (West Grove, PA) on Mr. Medicott. Stewart was second individually and Lapp finished third overall. It was an emotional win for the team. Dutton’s horse, Mr. Medicott, will retire after the The Event at Rebecca Farm. “I’ve been so lucky to ride him. He’s been good to me,” Dutton said. Mr. Medicott has competed in two Olympics with other riders, including Dutton’s father, Phillip Dutton. “Cave” as he is known in the barn, demonstrates the caliber of equine athletes vying for honors at Rebecca Farm. 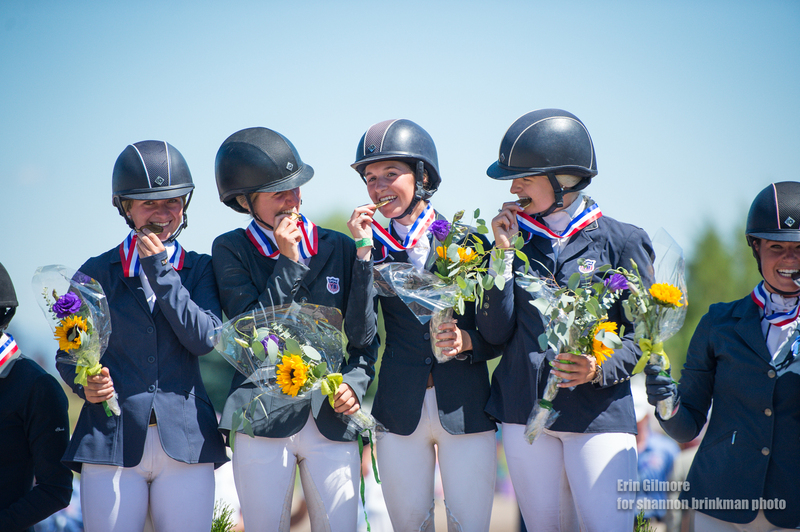 In the CCIJ1* division, the Area V team rose to the top of the rankings, even as a team member was unable to compete due to being “spun,” or failing to pass the initial inspection for soundness. That left remaining members with no room for error as they completed the challenging competition. Dedication and precision paid off for the team of McKinsey Wickman (Prosper, TX) on Dasset Profile, Georgia Dillard (Little Rock, AR) on Galileo and Georgia Phillips (Katy, TX) on Menue Rendezvous. They spoke effusively of each other and the horses that bore them to victory with a marking of 105.2. Wickman, who also swept the competition with her double gold victory as an individual rider, said she was “over the moon ecstatic with my horse and how he acted all weekend. He’s a star.” Wickman dominated throughout the week, turning in a final score of 28.6. Once again in 2018, admission for this family-friendly spectator event was free, with full concessions and a large multi-interest trade fair, as well as a free Kid Zone with pony rides, PonyUp! (Horsemanship 101 classes for kids), face painting, arts and crafts, and more. Guests were encouraged to donate a recommended $10 parking donation per car to support Halt Cancer at X, a special initiative spearheaded by the Broussard family. In 2018, the Halt Cancer at X fundraising goal was $100,000. The Broussard family was pleased to report that nearly $95,000 had been raised to date from The Event through parking donations, competitor contributions and special gifts from event patrons.